Hi guys! Just another day in Jersey where it's not quite Fall. A few nights ago I was freezing, drinking hot chocolate, and taking my winter clothes out. Now I have the AC on and I'm sweating up a storm. Eek. I wish Fall would just get here already, it's one of my favorite seasons. I guess I'm a little more cranky than I normally would be about the weather because I'm still feeling a bit sick. Between stomach bugs and constant headaches I feel like quite the mess. But as I always say, polishes help cheer me up quite a bit. Today I have another beautiful collection to share that I think you guys are going to love. I know I'm a huge fan. 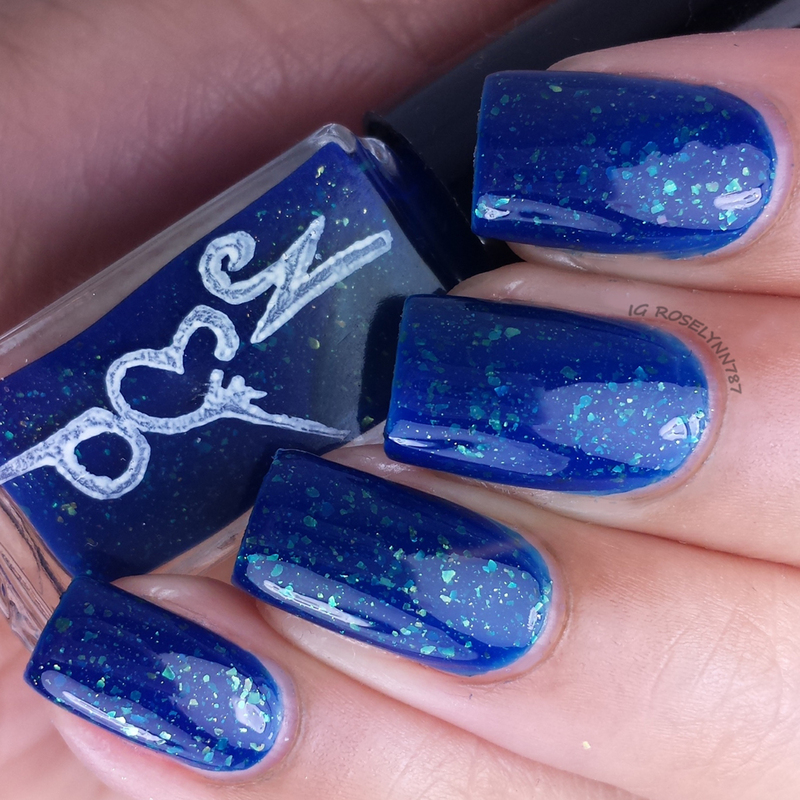 Here is the newly released Minerals Rock Collection by Nvr Enuff Polish. The Minerals Rock Collection by Nvr Enuff Polish consists of six polishes. 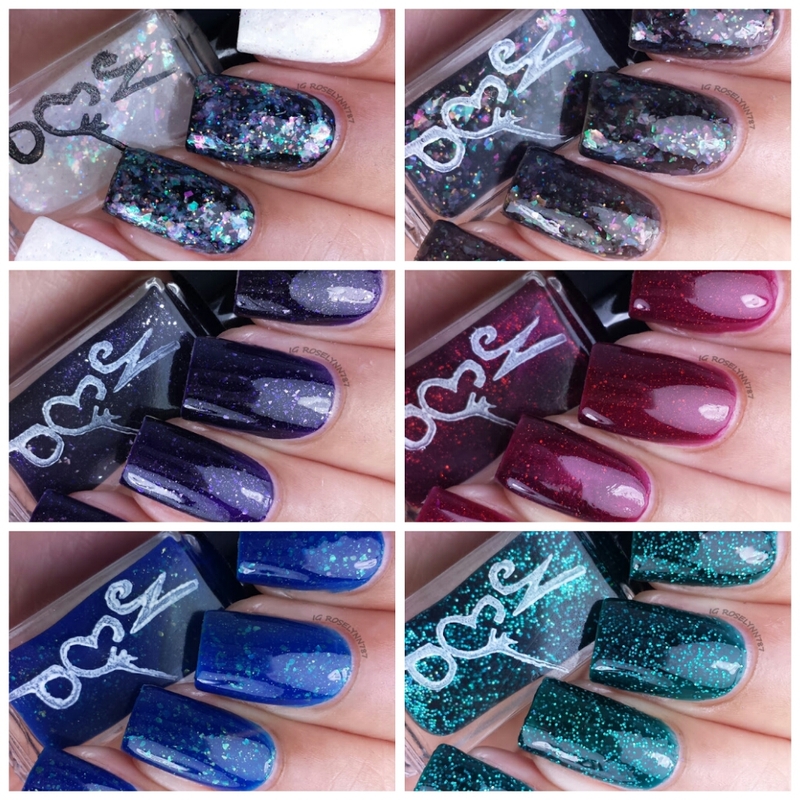 These polishes are available in both full and mini sizes, however, they are limited edition. Once they are sold out they will not be restocked so grab yours while you can. Opal is a multicolored, multi flakie 'topper'. This is best used over white in one to two coats for a real 'opal look' or thin coat over a darker color to show the dimension of the multi flake. This topper looks really cute over any color so you can't go wrong with what you pick. 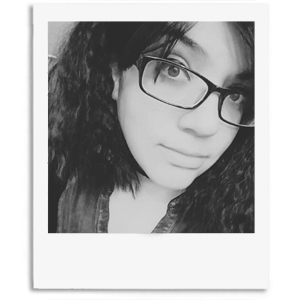 I was having a hard time choosing how I wanted to swatch it, so I choose to show you guys what it looks like over black and white. For some reason, I'm really digging the idea of this over a gradient. Formula was pretty good and easy to work with. I used two - three thin coats and applied them each using the dabbing method. 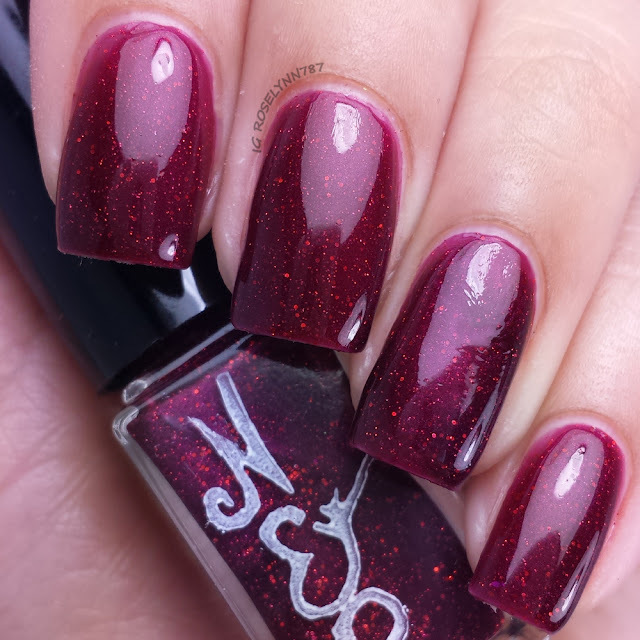 Star Garnet is a deep red/purple with red pearl shift, and lots of red holo dust and glitters. I love the wine shade, it's perfect for the season and Christmas. I swatched this beauty over a clear base coat, used two thin coats, and sealed with a glossy topcoat. Formula and consistency were excellent, no issues to report with this one. Black Opal is a black jelly filled with multicolored and multi sized flakeys. Unfortunately this one is already sold out in both bottle sizes. You can see the multi-colored flakes are very cute and give off a great finish. I swatched this over a clear base coat, used three thin coats, and applied it using the dabbing method. Dabbing is a must for this one. Formula and consistency were excellent, no issues to report. Iolite is a deep blurple cream with large and small silver flakies. Full size bottles have sold out, only minis are available for this particular one. I was so surprised by how opaque this one was in a single coat! I swatched this beauty over a clear base coat, used two thin coats, and sealed with a glossy topcoat. Formula and consistency were excellent, no issues to report with this one. Lapis Lazuli is a blue cream with large and small golden flakeys. Very vibrant and luxurious, isn't it? The flakes against the shade really pop out to me. I think this is another one of the colors in this collection that will look equally as fitting for the holiday/winter season. I swatched this one over a clear base coat, used three coats, and sealed with a glossy topcoat. Formula and consistency were excellent, no issues to report with this one. Dioptase is a dark teal jelly filled with turquoise holo hex. Words cannot describe how I feel about this particular polish. I love it! My definite must-have from this collection and for the season. 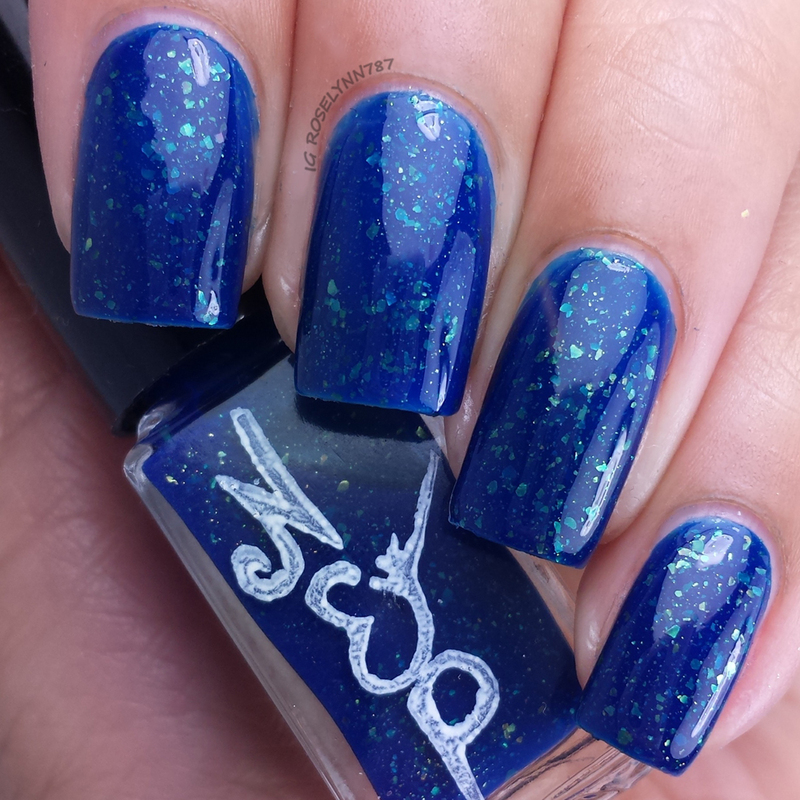 The glitter and color combination are perfection, to say the very least. I'm not even just saying that because I love the color teal haha. I swatched this one over a clear base coat, used three thin coats, and sealed with a glossy topcoat. It has a fantastic formula and consistency, it gave me no issues when applying. Although I used a glossy topcoat, a matte topcoat makes this polish look amazing. Fall is totally my favorite season! I wish it would get here already, too! and these polishes are gorgeous!